The Social Art Award is an initiative by the Institute for Art and Innovation. The goal of the Award is to explore and promote social art as a mean to foster social, ecological or political impact and change. The Award aims at strengthening the recognition of social artists and the value of their work. 1. By submitting to the Social Art Award 2017 the applicant hereby accepts these Competition Rules (Terms and Conditions). 2.1. The Award is open to anyone aged 18 years and over. There are no restrictions based on gender, training or nationality. 2.2. Applicants can submit one or more artworks/ projects, of any medium. Each submission must be based on a short description in English language and one image (photo or video/film still or other visualization) . The artworks/ projects must be accurately portrayed through the image submitted. 2.3. The applicants must be the owner of the artworks and the works submitted must be of their own origination. The applicants must hold all moral and intellectual property rights. 2.4. If selected for the exhibition, the applicants are responsible for transporting the original art work or proper material to the exhibition. 3.2. Applications must be submitted by March 31, 2017 – 11:59pm CET. 3.3. Any support requests must be directed to support@social-art-award.org before the closing time. 3.4. The image submitted must be no smaller than 0,2MB and no larger than 1MB (Recommended width of digital image: 2000 pixel). Should the submission get selected for the second stage of the award selection process, the applicant must be able to supply a high resolution image (10 x 15 cm, 300 dpi) suitable for printing. If the image quality is not good enough, it will lead to the cancellation of the application. 3.5. The description of the submitted artwork/ project should not extend 500 characters. The description should give a vital introduction to the artwork/ project and the impact generated. The second field should describe the relation of the artwork/ project submitted to the field of social art (not extending 200 characters). All descriptions must be delivered in English language. 3.6. 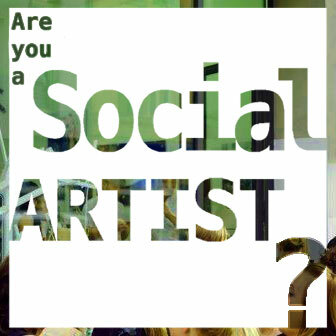 By submitting to the Award the applicant agrees and acknowledges that the Social Art Award and the Institute for Art and Innovation is permitted to receive the applicant’s registration data. 3.7. By submitting to the Award the applicant agrees that the Social Art Award and the Institute for Art and Innovation, may reproduce their work (at no fee) for communication purposes (including press, publicity, website, social media, promotion, catalog, books and any other printed or digital material in relation to the Social Art Award and the Institute for Art and Innovation), excluding for resale. 3.8. By submitting to the Award the applicant agrees to be placed on the mailing lists for newsletters or announcements of future calls and projects by the Institute for Art and Innovation. 4.1. A registration fee has to be paid to enter the award. The fee covers parts of the award’s organizational expenses. 4.2. The registration fee is 50.00 EUR for each work. If you submit two works it is 100.00 EUR etc. The reduced registration fee is 25.00 EUR for each work. If you submit two works it is 50.00 EUR etc. Eligible for reduced fees are applicants under 25. Citizens of eligible countries (please check list of UN) pay 0 EUR – they participate free of charge! To prove eligibility please send a copy of your passport (indicating age and/or place of birth and residence) to support@social-art-award.org. 4.3. The registration fee has to be transferred to the following bank account or paypal account stating “SAA2017 + artist name + work title (abbreviation as mentioned in submission)” in the reference field. Applicants must keep a copy of the payment. The applicant is responsible to cover all transfer fee charges, that might occur when wiring money into our Bank Account. Benificiary – Institute for Art and Innovation e.V. Please use this email-address support@social-art-award.org to wire your application fee into our account. 4.4. The registration fee must be received latest with the closing of the submission deadline by March 31, 2017 – 11:59pm CET. Not acknowledging theses conditions will lead to the cancellation of the application. 4.5. The registration fee is not refundable. 5.1. All applications submitted by March 31, 2017 – 11.59pm CET – including that the registration fee has been received till that date – enter the selection process. 5.2. The three-staged selection process runs from April 1 till June 30, 2017. 5.3. At the selection stage 1, the 50 most promising submissions to be published in the Social Art Award Book will be chosen. Those applicants will be noticed by email till May 15, 2017. To be eligible for the shortlist (stage 2), they will have to submit the extended application form consisting of a one pager and printable images in high resolution till May 21, 2017. The link to the extended application form will be provided in the notice email. Missing information or poor image quality will lead to the cancellation of the application. 5.4. At stage 2 a shortlist of 10 (+2 from public voting) will be selected for the final judgement. 5.5. At stage 3, the final judgement by the jury selects the 3 winners of the Social Art Award 2017. These will be officially announced at the award ceremony and opening of the exhibition of the Social Art Award in August/ September 2017 in Berlin, Germany. 5.6. The decisions of the jury and the organization team of the Social Art Award 2017 are final and no negotiation is accepted in regard of that. 6.1. There are 2 wild cards based on public voting. The 2 most voted artworks/ projects will enter the final judgement, stage 3 of the selection process. 6.2. The artworks/ projects selected at stage 1 of the selection process will enter the public voting. 7.1. 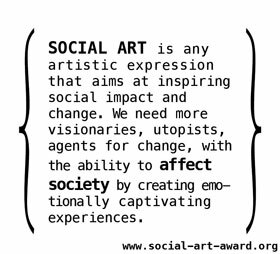 It is the goal of the Social Art Award to invigorate social art and strengthen social artists. The award recognizes the efforts and quality of artworks and projects in the field of social art. Additionally to the online platform, a printed book, the ceremony and the group exhibition extend the reach, create publicity, and build awareness for the field of social art and the artists and cultural producers involved. The applicants gain recognition and add value for their professional career. 7.2. The selected submissions of stage 1 will be covered and published in a book. Given that they provide the necessary extended application form including up to 3 printable images in high resolution. 7.3. The 3 selected artists of stage 2 will additionally present their artwork/ projects during a group exhibition in Berlin, Germany in August/ September 2017. Given that they provide the necessary extended application form including up to 3 printable images in high resolution. 7.4. All applicants will receive a digital version of the book and 2 printed copies of the book free of charge (excluding postal charges). To receive the printed copies the postal charges have to be covered by the applicant. For this purpose an extra email will be sent till August 2017 providing all necessary information and explaining the procedure. 8.1. The decisions of the awarding jury are unrecallable and undeniable. Each applicant gives to The Institute for Art and Innovation, without any compensation, the rights of reproduction, exhibition, publication, translation and communication to the public, in any manner and without exception, for their works and for the texts submitted for the selection.